Here's another fine piece of game memorabilia for your collection. 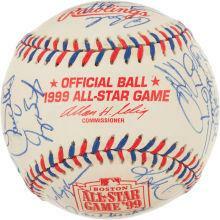 This Official Major League Baseball features the signatures of 34 members of the 1999 National League All Star Team. 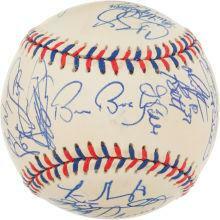 Most of the autographs rate "8-9" in strength. 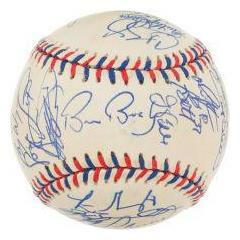 Highlights include: Randy Johnson, Gary Sheffield, Matt Williams, Bruce Bochy, Jose Lima, Jack McKeon, Luis Gonzalez, Mark McGwire, Jeromy Burnitz, Tony Gwynn, Curt Schilling, Mike Piazza, Barry Larkin and more. 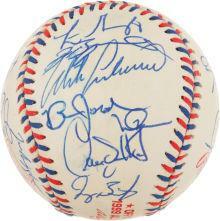 Some of the game's finest players of this era signed this ball. 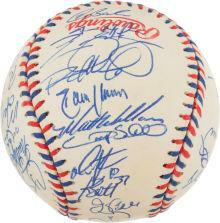 This ball comes with a Full Letter of Authenticity from James Spence Authentication. However, due to the singular nature of this item we must charge your credit card for the full price immediately upon taking your order. This policy ensures we reserve the ball for you. We will confirm your order by Email. 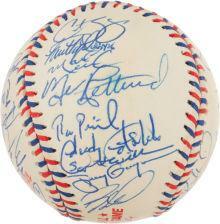 This ball is in stock and ready for shipping. 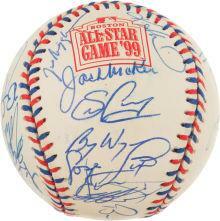 Ball is not game used.